by Jaime de la Puerta Salazar. As a passionate cave diver and traveller I have to admit that there is nothing like combining both passions. Just thinking about going to a different part of the world to do what I love the most makes my day. I´m sure many of the readers can relate to this when planning holidays. There is a third passion of mine which is food and eating well. Because of this Spain and France are two dangerous countries to visit! This year I brought my cave diving gear with me to Europe for my summer holidays. Inspired by the idea of diving, traveling, eating across Europe and learning more about different cave conditions, geology, techniques, access and logistics used in other parts of the world. Additionally, being exposed to these differences will definitely make me a more prepared cave diver and instructor. I flew from Mexico to Madrid, Spain where I´m originally from to collect some tanks, weights, more undergarments (certainly needed), gain a natural extra layer of thermal protection (not so necessary) and was finally ready to start the adventure accompanied by my good buddy and fellow instructor at ProTec Tulum, Tamara Lelani May. After a very nice stop over in Zumaia, a magical town on the north coast of Spain with great cuisine, we crossed into France and drove up to Gramat. Gramat is a tiny, beautiful town in the region of Lot where our friend Olivier Bertiaux manages some newly refurbished apartments. We stayed in comfort for a very affordable price of 25€ a night. Olivier also owns a dive center and filling station called “Oliv´Air” (Genius). Once our tanks were filled and our gear was ready to go for the first day of diving, we had some time off to visit the town and try some of the local goat cheese and beer (Ratz). A must! 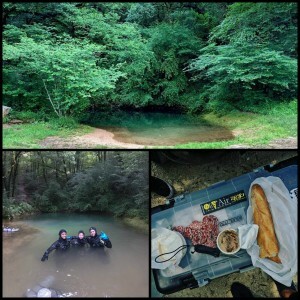 We had to start with the most famous cave in the area, France, and a reference in the world of cave diving. Just 45 mins drive southbound from Gramat we parked on the side of the road, geared up and entered the waters of the river Le Célé (13ºC). Immediately we noticed a big temperature difference compared with the caves in Mexico (25ºC), I was definitely not used to this! Using a helpful rope permanently fixed on the side of the river we pulled ourselves upstream until the rope descended down into the water leading us right to the entrance of the cave, which is in the river bed. Once inside the cave, with better visibility and less flow we started our slow but continuous swim into the earth, admiring every bit of it and marvelling at how different the walls look from what we are used to due to a different type of stone and materials. We also noticed differences in the way the guideline was laid and secured to the cave (snoopy loops, rubber loops fix to the line and wall/rock) and sometimes just weighted down by a stone. We passed by where the first T used to be and continued at a shallow depth until we reached the first drop down and started to get very excited. We then came to another drop where we reached a T, marked it and continued left until we saw an impressive drop. We followed it down, now even more excited until we reached -43m and in front of us appeared what seemed to be an endless tunnel. By that time we had penetrated a distance of about 420m and unfortunately had reached our turn pressure so we started heading back. What a nice surprise when we came back to the entrance and were welcomed with a beautiful green light illuminating it. When we were exiting the water and commenting on how cold we were and barely unable to move, we met some Dutch and Finnish divers that laughed and said that these were warm waters compared to the 4ºC they are used to. I can only say… Respect to all the divers around the world that dive these temperatures on a daily basis! Our Swiss friends, Sabine and Chris, arrived that night. After a welcoming dinner with some delicious local food and wine we planned two dives for the second day. Starting the day early we drove for about 40 mins leaving behind a beautiful castle and some pretty cool houses, parked the car next to what looked a bit like one of our beloved cenotes. It had a nice and easy access with bluish clear water! Font del Truffe! Without wasting a minute we got ready and started the dive. Crossing the small entrance (not too bad if you go in sidemount) we soon found ourselves swimming in a beautiful solution tunnel wide enough to swim comfortably. We made it all the way through the first syphon and arrived to the second, which fortunately it was flooded thanks to the rains the week before we arrived. This part of the cave was even prettier, smaller and more winding passages going from left to right, descending first and ascending after to end in an air pocket that separates the second and the third syphon. We decided to turn around at that point, after about 300m of penetration, and do a Jump left that we saw on the way in. Unfortunately the line didn´t go very far but still ended up in a much bigger air pocket with beautiful brown/orange stone and a good opportunity to use the spool with dry gloves. We turned and headed back to the entrance, exited the water and had an awesome and very French lunch, some saucisson (french salami), camembert, foie gras and baguette. 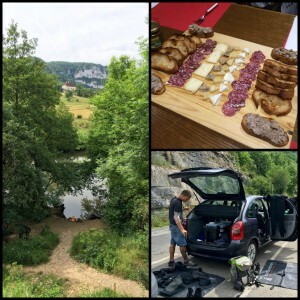 Once the four of us were satisfied, we started the drive to our next location, Combe Nègre, and after a million turns we parked next to the river Dordogne directly under a bridge of the highway. We walked down a little path to the river which was flowing very strongly. The entrance to the cave was downstream from the river access so we let ourselves float and be carried down the river until we saw on the left hand side a stone wall, a little sand patch next to the wall and right after it, the main line starting about 30cm/1ft above the water level. I loved this cave from the first minute, I was already pumped from the ride down the river. This cave has very clear almost white walls, starts small and remains like this, sometimes looking more like a round tunnel and other times more like a crevice. We turned the dive when we arrived at an air pocket after a very cool winding ascent. After the dive came the most tricky part, getting back to our starting point against the flow of the river, not easy, but fun!! Thanks Chris! Click here to watch the video that Tamara edited after that day! 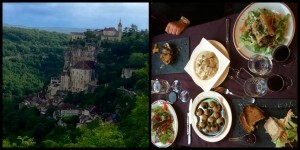 To top off the day we decided to drive to a spectacular town built on a cliff side, Rocamadour, and have dinner. I completely recommend the experience, the food as well as the view are amazing! A true experience!!! This is one of the furthest caves from Gramat but totally worth the visit. For this one, the level of water makes the difference between diving or crawling. We were again very lucky because it was just perfect, but this doesn´t mean that you will have easy access! This was without a doubt the longest distance between car and cave entrance, but if that wasn’t enough you have to walk on the slippery side of a small river, make a human chain to pass the tanks over the rocks, up a short but very steep hill and then down to a spectacular dry cave entrance. If the level of the water is good you should see a little area with water on the left hand side to gear up, and that is exactly what we did! We started the dive and soon realized that this was a bit of a darker cave, with very interesting features along the bottom of the cave. There was a small drop down and then a very cool vertical ascent continued by few air pockets, we turned the dive somewhere around syphon 5 about 750m in. Very glad that we had the opportunity to do this dive with the easiest conditions possible because even then it was quite a task to bring the gear back after the dive! Probably the favorite dive of them all for all of us and not as crowded as other sites. Driving southbound one more time from Gramat for about 45 mins and not far from Émergence du Ressel, we parked again on the side of the road in front of a sign that indicated the path to follow to find the entrance. It was quite a nice little pool with crystal clear water flowing out of a small hole. So small infact that the use of sidemount configuration is needed just to pass the entrance and the first few meters through a bedding plane. After that the cave is big enough to swim comfortably, very pretty, clear water and light coloured walls. Some of the most beautiful consecutive S shape turns carved in the rock by thousands of years of flowing water, astonishing!! We turned the dive after 510m when we reached the end of the first syphon. After the dive we went to have a look at Landenouze entrance to check the conditions where we met some Dutch ProTec clients! Unfortunately the water was kind of milky and the weather quite bad so we decided not to dive and rest for the next day, when we would have to drive about 750km to our next dive destination, El Pozo Azul in Spain! What to say about this dive??? We were very excited to dive the longest flooded cave in Europe, located in my home country in the province of Burgos, and check out all the good things we heard about it. We started the day early because there is a bit of a walk from the parking area to the pond where the entrance is. After carrying everything, we got in our dry suits and started to gear up when a school excursion of about 30 kids arrived and bombarded us with questions. It was very nice to explain them what we do and why! Then we sunk below the surface and swam through the crystal clear waters of the pond to the cave entrance, a small vertical crack that lead us into a dark brown underwater canyon. The day before we had checked the map and profile of the cave and set our goal on covering the whole first syphon, about 700m of penetration. We swam close to the ceiling, just above the line which it runs mostly in the higher part of the tunnel along the right wall, what it helps to conserve gas and reach further. After 10 minutes the cave got bigger and wider so we swam side by side admiring the cave. We were getting very close to our turn pressures when we saw the line heading up together with the bottom of the cave and there it was: surface again. We popped up and the first thing we noticed were a bunch of stalactites and a beautiful tunnel that continued half full of water for another 200m, so we followed it on the surface till we arrived to a mini waterfall. After contemplating the idea of taking our gear off and walking over to check the second syphon we decided wisely to head back since we were already cold. We swam all the way to the entrance and crossed through the light which was just magical. On the surface I tried to tell to Tamara how awesome the dive was, but my lips were frozen and numb like after a visit to the dentist and I couldn´t speak properly! I am definitely not made for cold water, only two hours on 12ºC water and I could barely talk! 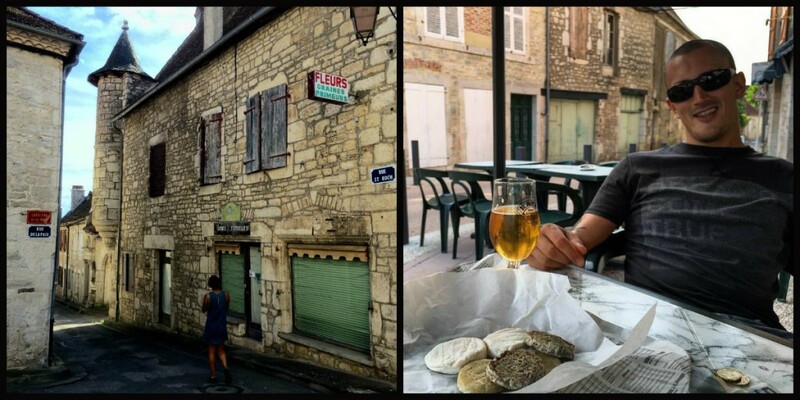 We packed everything and headed home, but we could not finish the trip without a great meal, so we stopped in a little town to eat some awesome local food and a quarter of baby lamb just the two of us! It was nice meeting old and new friends along the way… Sabine Sidi-Ali, Chris Braissant, Olivier Bertiaux, Frederic Van Wesemael, Filou, Simon Gurney and Ben Reymenants. Special thanks to Alvaro Roldán for tanks and extra undergarments, Olivier Bertiaux for the excellent treat received, Frederic Van Wesemael for the fillings, Sabine Sidi-Ali for her directions and recommendations and Juan Bermejo from Casco Antiguo for the weights. 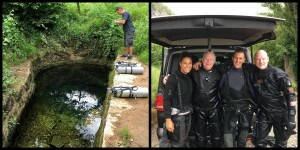 Have a nice day, keep travelling and cave diving, experience will only make you a better cave diver! And don´t forget to eat well, it will only make you happier!! Article by Jaime de la Puerta Salazar. Ponderosa: Bringing Old School Back! As a local Technical Cave Instructor from ProTec Dive Centres, I spend an awful amount of time at this Cenote. The reason for this is, ITS PERFECT for everything you need in a dive. If your Cavern or Intro level it has some amazing cave in the River Run. 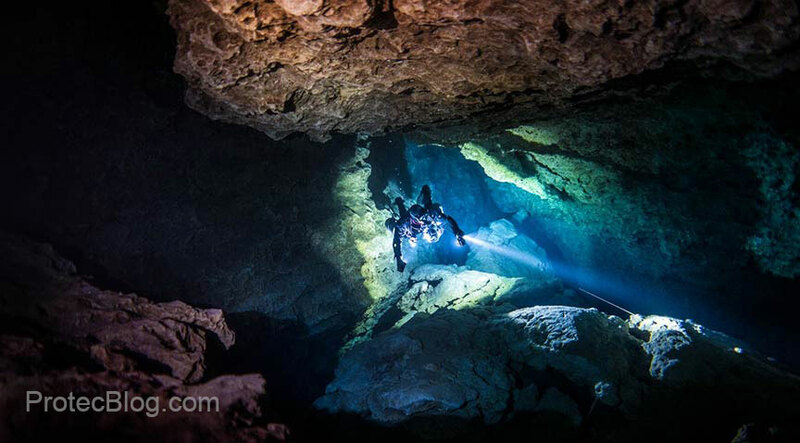 If your Full Cave and above, well it offers the perfect locations for Stage, Multi Stage and even DPV diving. 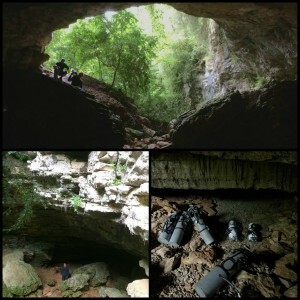 I was recently teaching a Cave/Navigation Refresher to a Full Cave diver. As we know our cave diving skills are perishable. If we don’t use it, we will lose it. So after a couple of dives at Ponderosa, we are chatting on the surface and he was like “Rob, this cave doesn’t offer much”. I laughed really, really, loudly (Yes ok again as everyone knows I laugh loudly ha ha) but I told him Ponderosa has kilometres of passageways, it’s a perfect place to cave dive, and to hone our skills as cave divers. I got my white board out and put pen to paper so to speak. I showed him lines that he never knew existed. I told him about places you can dive whether you are SM, BM or DPV. Where you can stage/multi stages and dive for hours! The next day he asked to go back to Ponde and for him to be shown some of these lines. On the first dive I decided to show him one such line in the cavern area. We tied in to the right and hugged the wall, descended sharply, took a right and hey presto, first line of the day. It goes right into a halocline, and it’s a pretty big cave. If you travel on the mainline, you end up at the far end of the cavern line. It’s a pretty good circuit for beginners to complete after they are full cave trained, it is a complex circuit with 2 jumps and arrows facing in opposing directions. It’s a very silty place, with halocline pretty much all the way. You’re in fresh, then salt, then fresh, back into salt water, so it makes the dive team plan and think ahead. It also gave me chance to “wander” off the line to see how his awareness was. Great job, he caught me and told me to stay on the line. Where the arrows go back to back, we jumped into a low silty bedding plain. Not really small just small enough for me to create a little bit of silt, to “help” him navigate his way home. It’s important to note that we were in SM configuration. So after the silt, and diminished visibility, out comes Mr Santi and now for him its lights out. He then made one of the most common mistakes by not clipping and stowing his primary light and thus leaving the light cable susceptible to entanglements. However, after a couple of reminders he did a really good job of packing it away and finding his way to the water surface. Great job dude came first … then came my debrief. Second dive involved jumps, T’s and all in-between. I decided to take him into the River Run, jump to an unmarked jump off the main line, follow until end of line, jump to another line, and go left. When we came to the first of 3 T’s, we went right, right, and right again. At this point, I signal to the diver to hold, gave him my wet notes and I’ve already written down a question “what is the navigation to the surface” he completes the exercise, then Mr Santi comes out. Great job. He remembers his way home. At the end of days debrief, he asks again to come back and be shown some more routes. How awesome is that, so of course we come back the next day! As we pull up at Ponde in the morning were are discussing DPV diving and Multi Stage diving. He informs me that he would like to book a Stage class sometime, and would like to know where to dive after the Stage class. So, why not take him to the thunder cave I recently “discovered” when stage diving I thought. So far to date I’ve not gone far up this massive tunnel, it makes the River Run look small, therefore you could call it thunder cave right? We navigated our way down the tunnel say 10mins, we come across maybe 3 jumps already, but the darkness just keeps going. We hit thirds and turn, then he hits zero visibility. As this was his last day on the refresher course he also is the winner of an OOG diver in zero viz award, he also wins the entanglement award. At the end of the day, sitting on the tailgate going over my wet notes, giving him his strong points, but also informing him of his weaker points, he tells me ponderosa is an amazing cave. Like I tell all my clients, we forget that these “older” caves that we train in are more than just the River Run or the Little Joe line. To be honest most cave divers and instructors do not spend enough time at these sites to really know what is there. It seems to be the new trend to try to squeeze into new virgin cave, or visit Muyil as “I’m a sidemount diver I should dive small cave”. I always tell them, they are missing out on some awesome diving. Ponderosa is more than a training site, it is navigational heaven once you venture off the mainline, it is a DPV site, and it is a multi-stage site. By all means, please feel free to dive the caves “off the beaten track”, I do too whenever I can. However, what I am trying to say is don’t forget places like the Pit, Carwash and of course Ponde offer everything you need too. I am currently involved in a personal project to dive these caves and learn new routes to take clients, to show you how good these sites can be. Right now in the pit I’m 3 dives into my project and I am already racking up bottom time of 19hours (CCR of course). So you see, whatever you need, we here at ProTec can offer some advice, no matter if you dive with us or not, we are happy to give you some ideas of where to go. Enjoy the caves, and Safe diving people!!!!!!!! !